Wish you all a very happy Gudi Padwa.May the new year bring you lot of happiness and prosperity. Gudi Padwa signifies the beginning of a new year,as per Hindu calendar.It is also known as Ugadi in Karnataka and Andhra Pradesh.Growing up Gudi Padwa to me meant-New clothes all day long and yummy food.It also meant lunch(if it was a Sunday) or dinner with family friends.We were always away from family but there were more than enough honorary uncles and aunts to make it feel like family time.Mom sloughed in the kitchen to prepare delicacies and then,in the evening,after a good scrub,we donned our second pair of new clothes and waited our guests. 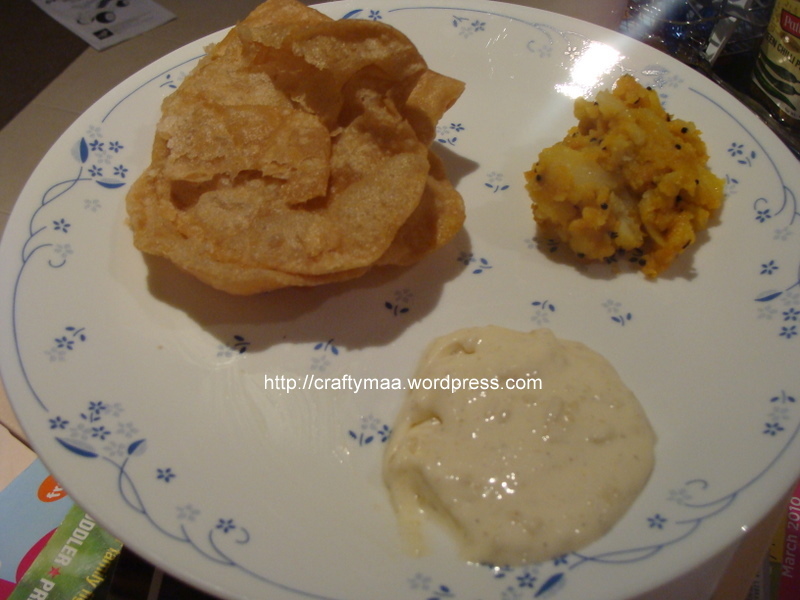 To me a festive meal means Puri-batata bhaji-Masale Bhaat and koshimbir and a dessert. The dessert can vary,but it is not a festive meal without the other four. Batata bhaji or Potato subji has to be made in a particular way- Boiled potato pieces,tempered with turmeric,green chilies,mustard seeds,hing and garnished with corriander leaves. This year for Our Menu for Gudi Padwa dinner was- Puri-Potato Bhaaji,Masala bhaat,koshimbir and Shrikhand.DH loves Shrikhand and this is the first time I actually made it.I have had the recipe for a long long time..but just never used it. I think my friend,AP,passed it on,roughly and I eye-balled the ingredients. * 1/4 cup chopped nuts – run the nuts through a chopper till coarse. Add the sugar to the sour cream and mix well with a spoon till all the sugar is dissolved. Add the chopped nuts and charoli dana and the saffron milk.Stir well and chill for 1- 2 hours. End Result- The shrikhand had a nice silky consistency.I added a little more nuts because we like nuts in our shrikhand. You can add a little more sugar to make it sweeter. Next Post Happy Gudi Padwa and Giveaway announcement. i am going to so try the sour cream shrikhand…. And I can guarantee that you will love it!